It only took a combined three rounds for team Tiger Muay Thai & MMA Training Camp Phuket, Thailand fighters to send their opponents to the canvas, putting on a display of power and technical ability that won fans over at Patong Boxing Stadium Monday night (May 14th). Both Miki’ala Freitas and Alexander Mazur sent a message: don’t mess with the Tiger. Maybe it was the luck of the trunks as Mazur, who had forgotten his own pair, had to borrow Freitas’ just before his fight. It turned out to be the right move. 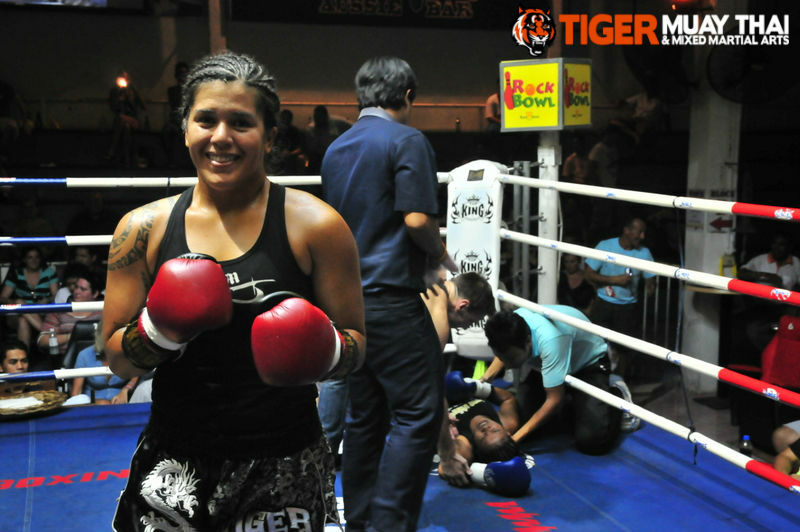 Freitas, of Hawaii, is now 2-0 in her Muay Thai career and it only took her a mere two and a half minutes to knock out her opponent, 18-year-old Thai fighter Nongmay, with a devastating punch and right kick combination to the midsection. “Going into this fight I knew that the first two rounds [she would] come out slow, but I wanted to fight my fight and go at my pace,” said Freitas (see the fight here). Calm and confident throughout the bout, Freitas felt right at home doling various combinations before finding the sweet spot. “This fight I added a bit of variations to my combos – it felt good when I get her with the body shot,” she said. 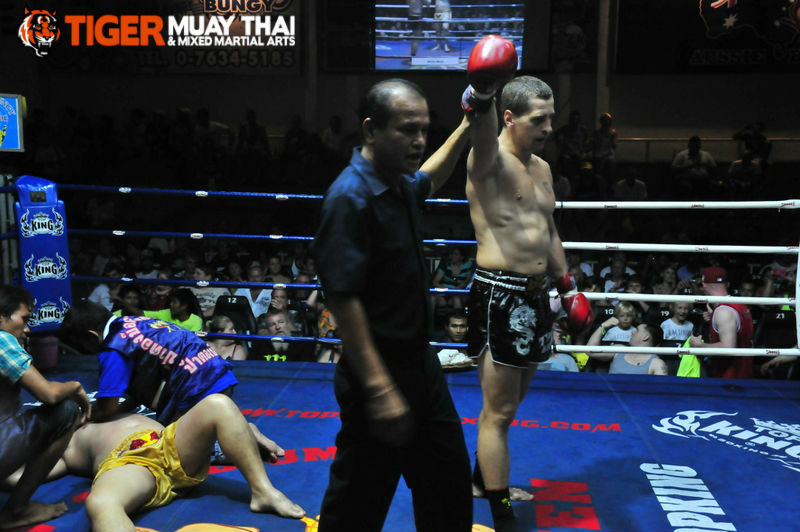 For Mazur, a veteran of 120 kickboxing fights, the bout was an exercise in timing as he picked his opponent apart with several punch and low-kick combinations. The big Russian finally dropped his 29-year-old foe Jackgrid, who has had over 30 fights under his belt, when the Thai went for a kick. Mazur grabbed the leg, punched Jackgrid with a right cross and gave a violent sweep of the leg, ending the bout in the second round. “I knew in the first round he was not prepared enough and that is why I think I won,” said Mazur, whose record improved to 3-1 (see his fight here).